You know the old saying, “Milk is the window to the soul?” It can’t be a window unless you put it in a glass. Here’s how you put milk in a glass. Grasp the handle of the container in which the milk is in with your hand. Lift it in an upwards direction, towards the ceiling, by moving your arm in an upwards direction while still holding the container handle with your hand. Position the opening, or orifice, of the container over, or on top of, some type of receptacle such as a glass, cup, mug, bowl, teacup, small pitcher, measuring cup or saucer. Tilt the container of milk so the opening faces in a downward direction, toward the ground, over the orifice of the glass, cup, mug, bowl, teacup, small pitcher, measuring cup or saucer. The milk should flow out in a downwards direction into the receptacle. Before you do anything else, you should buy some milk. It comes in big plastic things, or, if you live in the 1950s, a man brings it by in a glass bottle. Make sure that the container of milk you are pouring has been refrigerated. If the container of milk has been left out all night because someone forgot to put it away, the milk will smell very bad and be all chunky. That’s not pouring milk. That’s poor milk. 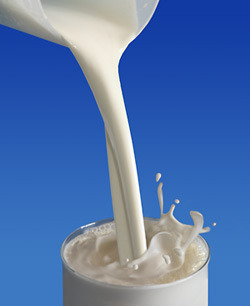 Milk usually comes from cows, and that milk is the easiest to pour. It is possible to pour milk from a goat, camel or person but in many states you need a permit. Make sure what you’re pouring is milk. Don’t pour ilk, mink or anyone named Mike.